On July 26, 2014, Matt Pollock and I captured a spherical panorama of green airglow, the Milky Way, and star trails over Bar Harbor from Cadillac Mountain in Acadia National Park, Maine. Cassiopeia can be seen in the left side of the Milky Way arch. The Big Dipper is to the left of Bar Harbor. Polaris (the north star) and the Little Dipper sits between them. I’ve shot several spherical panoramas of star trails with my Panoneed robotic panning head, but Matt and I wondered how difficult it would be with a manual panning head. Obviously, we didn’t want to be rotating it every 30 seconds or so for 2 hours, so we decided to shoot three 40 minute timelapses with a Nikon 10.5mm f/2.8 fisheye that has had the lens hood shaved off for full frame use, rotating every 120° to capture three stacks of star trails that I blended into a single panorama of star trails. 10.5mm is not wide enough to capture the entire sky, and anything wider is usually f/3.5 or smaller aperture (within a reasonable price range anyway!). Surprisingly, it worked very well! 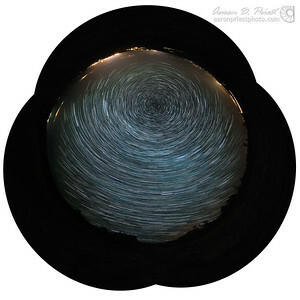 The full sphere consists of 5 photos of the sky blended with 4 photos of the ground, plus another 249 images for the star trails (3 x 83) layered on top. It took about 22 minutes to shoot the Milky Way and ground from 11:30 – 11:52 PM, and 2 hours of shooting star trails from 01:06 – 03:07 AM. In between we shot some dark frames and tried various shutter speeds and ISOs for ideal exposures, and setup the dew heater on the lens so it wouldn’t fog up. We’d been battling with fog and clouds for a few nights in a row and almost gave up on this night as well, but decided to stick it out another hour or so and we were rewarded when the fog suddenly lifted after 11PM. We had three other cameras, tripods, sliders, and remotes in the truck that we really should have set up to shoot some motion-controlled timelapse video, but we were too busy looking at the stars and chatting all night to think about any of that! We documented each row and the number of degrees of tilt and rotation on my iPhone via the voice recording app, because we were doing separate exposures for the sky, ground, and star trails and I didn't want to be confused in PTGui later. For the star trails, we decided to do three directions with the 10.5mm fisheye instead of 2, turning every 120° and pitched up at 45° for plenty of overlap. I was very careful to center the north star in one of the three star trails angles, and the Milky Way in another, to make blending much easier (one of the reasons we did three). We shot for about 40 minutes in each direction, capturing at least 83 photos of 25 seconds for stacking (we divided the time we had before astronomic dawn into three and that's why 40 minutes apiece and not longer). I stacked them first into three 16-bit TIFFs that I stitched with PTGui. I hand blended them in Photoshop though via masks to knock down the brightness of the Milky Way. Since we didn't move the tripod or the 0° reference on the panning head, it was very easy to align the layers later in PTGui and Photoshop. Camera settings: ISO 6400, f/2.8, 40 seconds, & 3550°K white balance for the sky blended with ISO 6400, f/2.8, 160 seconds, & 3786°K white balance for the ground. Star trails were shot at ISO 1600, f/2.8, 25 seconds, & 3550°K white balance. I removed several airplane trails before stacking. Hardware used: Nikon D810, Nikon 10.5mm f/2.8 (lens hood shaved off for full frame use), Promote Control, and Really Right Stuff TVC-34L tripod with leveling base & multi-row pano package. Software used: Edited with Lightroom, stitched with PTGui Pro, and blended with Photoshop. Pixel Fixer was used with a dark frame to remove hot pixels from long exposures at high ISO. Star trails were stacked with Advanced Stacker Plus. The star spikes on the Big Dipper were added with Star Spikes Pro. The full sphere can be explored here or by clicking on the preview photo. 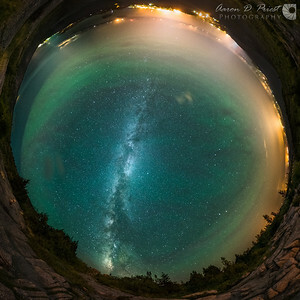 On July 26, 2014, Matt Pollock and I captured a spherical panorama of green airglow and the Milky Way over Bar Harbor from Cadillac Mountain in Acadia National Park, Maine. This is a crop of the panorama. Cassiopeia can be seen in the left side of the Milky Way arch. The Big Dipper is to the left of Bar Harbor. Polaris (the north star) and the Little Dipper sits between them. The full sphere consists of 5 photos of the sky blended with 4 photos of the ground. It took about 22 minutes to shoot from 11:30 – 11:52 PM. We spent the rest of the night shooting a timelapse for star trails. Camera settings: ISO 6400, f/2.8, 40 seconds, & 3550°K white balance for the sky blended with ISO 6400, f/2.8, 160 seconds, & 3786°K white balance for the ground. Hardware used: Nikon D810, Nikon 10.5mm f/2.8 (lens hood shaved off for full frame use), Promote Control, and Really Right Stuff TVC-34L tripod with leveling base & multi-row pano package. Software used: Edited with Lightroom, stitched with PTGui Pro, and blended with Photoshop. Pixel Fixer was used with a dark frame to remove hot pixels from long exposures at high ISO. The star spikes on the Big Dipper were added with Star Spikes Pro. On July 26, 2014, Matt Pollock and I captured a spherical panorama of green airglow and the Milky Way over Bar Harbor from Cadillac Mountain in Acadia National Park, Maine. This is a crop of the panorama. Cassiopeia can be seen in the left side of the Milky Way arch. Vega can be seen overhead, it is part of the summer triangle along with Deneb and Altair. Camera settings: ISO 6400, f/2.8, 40 seconds, & 3550°K white balance for the sky blended with ISO 6400, f/2.8, 160 seconds, & 3786°K white balance for the ground. Hardware used: Nikon D810, Nikon 10.5mm f/2.8 (lens hood shaved off for full frame use), Promote Control, and Really Right Stuff TVC-34L tripod with leveling base & multi-row pano package. Software used: Edited with Lightroom, stitched with PTGui Pro, and blended with Photoshop. Pixel Fixer was used with a dark frame to remove hot pixels from long exposures at high ISO. On July 26, 2014, Matt Pollock and I captured a spherical panorama of green airglow and the Milky Way over Bar Harbor from Cadillac Mountain in Acadia National Park, Maine. This is a crop of the panorama simulating an ~8mm fisheye. Cassiopeia can be seen in the left side of the Milky Way arch. Vega can be seen overhead, it is part of the summer triangle along with Deneb and Altair. Camera settings: ISO 6400, f/2.8, 40 seconds, & 3550°K white balance for the sky blended with ISO 6400, f/2.8, 160 seconds, & 3786°K white balance for the ground. Hardware used: Nikon D810, Nikon 10.5mm f/2.8 (lens hood shaved off for full frame use), Promote Control, and Really Right Stuff TVC-34L tripod with leveling base & multi-row pano package. Software used: Edited with Lightroom, stitched with PTGui Pro, and blended with Photoshop. Pixel Fixer was used with a dark frame to remove hot pixels from long exposures at high ISO. 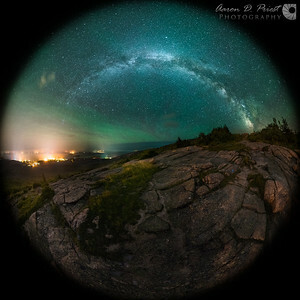 On July 26, 2014, Matt Pollock and I captured a spherical panorama of green airglow and the Milky Way over Bar Harbor from Cadillac Mountain in Acadia National Park, Maine. This crop is an ~6mm view of the whole sky. The full sphere consists of 5 photos of the sky blended with 4 photos of the ground. It took about 22 minutes to shoot from 11:30 – 11:52 PM. We spent the rest of the night shooting a timelapse for star trails. Camera settings: ISO 6400, f/2.8, 40 seconds, & 3550°K white balance for the sky blended with ISO 6400, f/2.8, 160 seconds, & 3786°K white balance for the ground. Hardware used: Nikon D810, Nikon 10.5mm f/2.8 (lens hood shaved off for full frame use), Promote Control, and Really Right Stuff TVC-34L tripod with leveling base & multi-row pano package. Software used: Edited with Lightroom, stitched with PTGui Pro, and blended with Photoshop. Pixel Fixer was used with a dark frame to remove hot pixels from long exposures at high ISO. On July 26, 2014, Matt Pollock and I captured a spherical panorama of green airglow, the Milky Way, and star trails over Bar Harbor from Cadillac Mountain in Acadia National Park, Maine. I’ve shot several spherical panoramas of star trails with my Panoneed robotic panning head, but Matt and I wondered how difficult it would be with a manual panning head. Obviously, we didn’t want to be rotating it every 30 seconds or so for 2 hours, so we decided to shoot three 40 minute timelapses with a Nikon 10.5mm f/2.8 fisheye that has had the lens hood shaved off for full frame use, rotating every 120° to capture three stacks of star trails that I blended into a single panorama of star trails. 10.5mm is not wide enough to capture the entire sky, and anything wider is usually f/3.5 or smaller aperture (within a reasonable price range anyway!). Surprisingly, it worked very well! 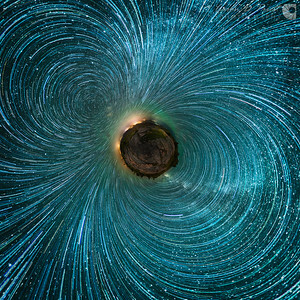 The full sphere consists of 5 photos of the sky blended with 4 photos of the ground, plus another 249 images for the star trails (3 x 83) layered on top. It took about 22 minutes to shoot the Milky Way and ground from 11:30 – 11:52 PM, and 2 hours of shooting star trails from 01:06 – 03:07 AM. In between we shot some dark frames and tried various shutter speeds and ISOs for ideal exposures, and setup the dew heater on the lens so it wouldn’t fog up. We’d been battling with fog and clouds for a few nights in a row and almost gave up on this night as well, but decided to stick it out another hour or so and we were rewarded when the fog suddenly lifted after 11PM. We had three other cameras, tripods, sliders, and remotes in the truck that we really should have set up to shoot some motion-controlled timelapse video, but we were too busy looking at the stars and chatting all night to think about any of that! Camera settings: ISO 6400, f/2.8, 40 seconds, & 3550°K white balance for the sky blended with ISO 6400, f/2.8, 160 seconds, & 3786°K white balance for the ground. Star trails were shot at ISO 1600, f/2.8, 25 seconds, & 3550°K white balance. I removed several airplane trails before stacking. Hardware used: Nikon D810, Nikon 10.5mm f/2.8 (lens hood shaved off for full frame use), Promote Control, and Really Right Stuff TVC-34L tripod with leveling base & multi-row pano package. Software used: Edited with Lightroom, stitched with PTGui Pro, and blended with Photoshop. Pixel Fixer was used with a dark frame to remove hot pixels from long exposures at high ISO. Star trails were stacked with Advanced Stacker Plus. On July 26, 2014, Matt Pollock and I captured a spherical panorama of green airglow, the Milky Way, and star trails over Bar Harbor from Cadillac Mountain in Acadia National Park, Maine. This is a crop of the panorama. The full sphere consists of 5 photos of the sky blended with 4 photos of the ground, plus another 249 images for the star trails (3 x 83) layered on top and can be explored on Roundme: http://round.me/tour/4844/view Camera settings: ISO 6400, f/2.8, 40 seconds, & 3550°K white balance for the sky blended with ISO 6400, f/2.8, 160 seconds, & 3786°K white balance for the ground. Star trails were shot at ISO 1600, f/2.8, 25 seconds, & 3550°K white balance. I removed several airplane trails before stacking. Hardware used: Nikon D810, Nikon 10.5mm f/2.8 (lens hood shaved off for full frame use), Promote Control, and Really Right Stuff TVC-34L tripod with leveling base & multi-row pano package. Dew-Not heater strip powered by a DewBuster controller and Goal Zero Sherpa 100. Software used: Edited with Lightroom, stitched with PTGui Pro, and blended with Photoshop. Pixel Fixer was used with a dark frame to remove hot pixels from long exposures at high ISO. Star trails were stacked with Advanced Stacker Plus. 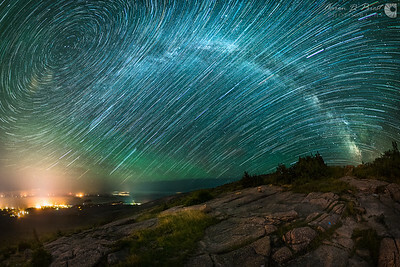 On July 26, 2014, Matt Pollock and I captured a spherical panorama of green airglow, the Milky Way, and star trails over Bar Harbor from Cadillac Mountain in Acadia National Park, Maine. This is a crop of the panorama simulating an ~8mm fisheye. 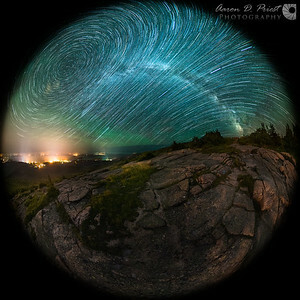 The full sphere consists of 5 photos of the sky blended with 4 photos of the ground, plus another 249 images for the star trails (3 x 83) layered on top and can be explored on Roundme: http://round.me/tour/4844/view Camera settings: ISO 6400, f/2.8, 40 seconds, & 3550°K white balance for the sky blended with ISO 6400, f/2.8, 160 seconds, & 3786°K white balance for the ground. Star trails were shot at ISO 1600, f/2.8, 25 seconds, & 3550°K white balance. I removed several airplane trails before stacking. Hardware used: Nikon D810, Nikon 10.5mm f/2.8 (lens hood shaved off for full frame use), Promote Control, and Really Right Stuff TVC-34L tripod with leveling base & multi-row pano package. Dew-Not heater strip powered by a DewBuster controller and Goal Zero Sherpa 100. Software used: Edited with Lightroom, stitched with PTGui Pro, and blended with Photoshop. Pixel Fixer was used with a dark frame to remove hot pixels from long exposures at high ISO. Star trails were stacked with Advanced Stacker Plus. On July 26, 2014, Matt Pollock and I captured a spherical panorama of green airglow, the Milky Way, and star trails over Bar Harbor from Cadillac Mountain in Acadia National Park, Maine. This crop is a ~6mm view of the whole sky. The full sphere consists of 5 photos of the sky blended with 4 photos of the ground, plus another 249 images for the star trails (3 x 83) layered on top and can be explored on Roundme: http://round.me/tour/4844/view Camera settings: ISO 6400, f/2.8, 40 seconds, & 3550°K white balance for the sky blended with ISO 6400, f/2.8, 160 seconds, & 3786°K white balance for the ground. Star trails were shot at ISO 1600, f/2.8, 25 seconds, & 3550°K white balance. I removed several airplane trails before stacking. Hardware used: Nikon D810, Nikon 10.5mm f/2.8 (lens hood shaved off for full frame use), Promote Control, and Really Right Stuff TVC-34L tripod with leveling base & multi-row pano package. Dew-Not heater strip powered by a DewBuster controller and Goal Zero Sherpa 100. Software used: Edited with Lightroom, stitched with PTGui Pro, and blended with Photoshop. Pixel Fixer was used with a dark frame to remove hot pixels from long exposures at high ISO. Star trails were stacked with Advanced Stacker Plus. On July 26, 2014, Matt Pollock and I captured a spherical panorama of green airglow, the Milky Way, and star trails over Bar Harbor from Cadillac Mountain in Acadia National Park, Maine. 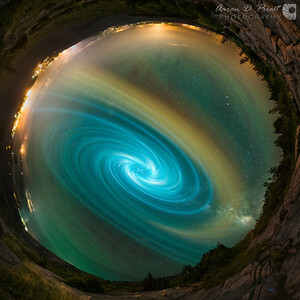 This is a “little planet” projection of the panorama. I like how the star trails almost look like Earth’s magnetic field! The full sphere consists of 5 photos of the sky blended with 4 photos of the ground, plus another 249 images for the star trails (3 x 83) layered on top and can be explored on Roundme: http://round.me/tour/4844/view Camera settings: ISO 6400, f/2.8, 40 seconds, & 3550°K white balance for the sky blended with ISO 6400, f/2.8, 160 seconds, & 3786°K white balance for the ground. Star trails were shot at ISO 1600, f/2.8, 25 seconds, & 3550°K white balance. I removed several airplane trails before stacking. Hardware used: Nikon D810, Nikon 10.5mm f/2.8 (lens hood shaved off for full frame use), Promote Control, and Really Right Stuff TVC-34L tripod with leveling base & multi-row pano package. Dew-Not heater strip powered by a DewBuster controller and Goal Zero Sherpa 100. Software used: Edited with Lightroom, stitched with PTGui Pro, and blended with Photoshop. Pixel Fixer was used with a dark frame to remove hot pixels from long exposures at high ISO. Star trails were stacked with Advanced Stacker Plus. 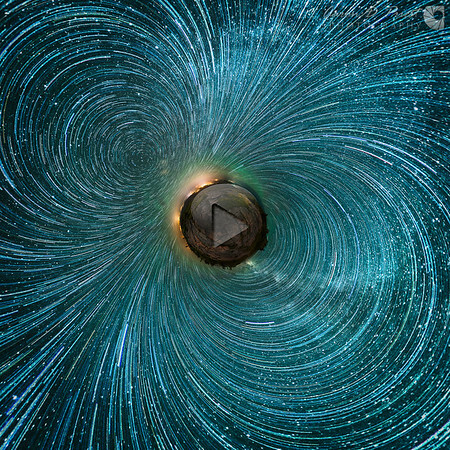 Everyone has been making these beautiful “twirl” photos in Photoshop lately, and it got me thinking that it might look really interesting in a spherical panorama of the Milky Way—half like a galaxy and half like a crazy time warp! 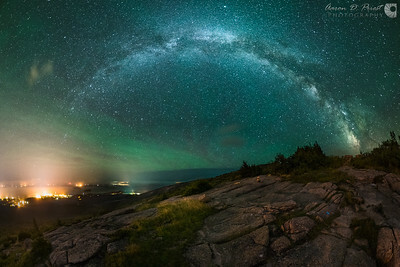 So here’s my take on the abstract twirl… The Milky Way and green air glow that is behind the twirl were taken by Matt Pollock and I from Cadillac Mountain in Acadia National Park, Maine on July 26, 2014. This is a crop of a spherical panorama, looking straight up like a fisheye lens. The full sphere consists of 5 photos of the sky blended with 4 photos of the ground. It took about 22 minutes to shoot from 11:30 – 11:52 PM. We spent the rest of the night shooting a timelapse for star trails. Camera settings: ISO 6400, f/2.8, 40 seconds, & 3550°K white balance for the sky blended with ISO 6400, f/2.8, 160 seconds, & 3786°K white balance for the ground. Hardware used: Nikon D810, Nikon 10.5mm f/2.8 (lens hood shaved off for full frame use), Promote Control, and Really Right Stuff TVC-34L tripod with leveling base & multi-row pano package. Software used: Edited with Lightroom, stitched with PTGui Pro, and blended with Photoshop. Pixel Fixer was used with a dark frame to remove hot pixels from long exposures at high ISO. Hardware used: Nikon D810, Nikon 10.5mm f/2.8 (lens hood shaved off for full frame use), Promote Control, and Really Right Stuff TVC-34L tripod with leveling base & multi-row pano package. Dew-Not heater strip powered by a DewBuster controller and Goal Zero Sherpa 100. Software used: Edited with Lightroom, stitched with PTGui Pro, and blended with Photoshop. Pixel Fixer was used with a dark frame to remove hot pixels from long exposures at high ISO. Star trails were stacked with Advanced Stacker Plus.